Pastry-Wrapped Brie, Gluten-Free? Mais, Oui! Francophilia reigns in our house. I took French lessons from junior high through my college years and revel in the sensuous sound of the French language whenever we visit Montreal or hear French Canadian visitors here in upstate New York. Dan and I honeymooned in Quebec City and my two daughters have picked French as their second language. Someday, I hope to cross the pond for an extended visit, but until then, armchair travels with books will have to suffice. 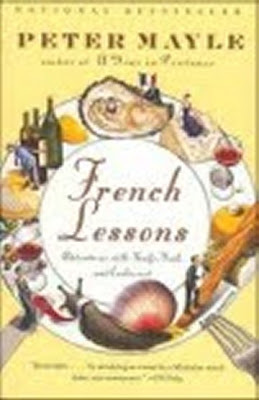 Peter Mayle's "French Lessons: Adventures with Knife, Fork, and Corkscrew" is the current book pick for Cook the Books, the virtual book club for foodies, and like Mayle's other books about his adopted home, the writing captures his bemused impressions of the French landscape, the food, and the people. The Provence books capture life as an expat Englishman trying to adapt to a life where one's central priorities and the pace of life itself are quite different. And historic home renovations are not accomplished in a day, a month, a year, perhaps several years. "French Lessons" is entirely about the French preoccupation with one's meals and the various food festivals that Mayle explores throughout France. We travel to many regions to celebrate frog legs, truffles, snails, spa cuisine, the sublime chickens of Bresse, Livarot cheese and other delights, and in my favorite chapter, "A Connoisseur's Marathon", are treated to the spectacle of the Marathon du Medoc, a long-distance road race in which 8,000 participants run 26 miles through the vineyards of Bordeaux. Only one quarter of the runners aspire to seriousness in the race (though the winner receives his/her weight in wine); the others are there to have fun, clad in crazy, cross-dressing costumes, and helping themselves to superior wines and gourmet snacks at civilized refreshment stations along the race course. "The text was scholarly in tone, and there were no unnecessary typographical flourishes. In other words, it was a serious piece of work, designed to inform students and breeders of the mollusk, rather than entertain snail diletantes like me. But serious work though it was, a Frenchman had written it. And so, inevitably, there was a recipe section". I read "French Lessons" last month and it inspired me to attend two local food festivals in our area, Bennington's Garlic Festival and the Washington County Cheese Tour. After all that luscious cheese sampling, I wanted to try my hand at baking some pastry-wrapped Brie for a savory appetizer course for the mister and me one romantic day when both girls were out with their friends. Doing so when gluten is not your enemy is easy enough. Wrap one piece of store-bought Brie in some thawed store-bought puff pastry, heat it all up in the oven and then attack the gooey result with gusto. Alas, the gluten-free diner must approach this simple culinary project with the perusing of many wheatless pastry recipes and then attempt to cover their cheese without the whole crumbling, flopping over and sticking to rolling pins and countertops. 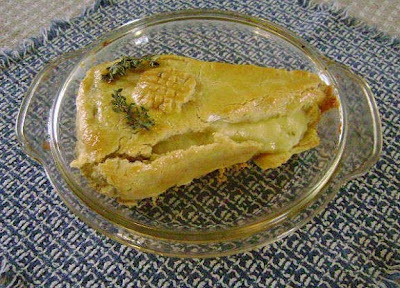 Surprisingly, I couldn't find a recipe online or in my arsenal of cookbooks for a gluten-free pastry-wrapped Brie. Clearly, there are unchartered waters here. It was easy enough to find a luscious wedge of herb-infused Brie at the supermarket, but the pastry, which would have to be flaky when cooked and not outlandishly hard to maneuver around my cheese when raw, was a stumper. Eventually, I came upon this recipe on a cooking message board which seemed like a good launching point, though the pastry recipe was intended to house an appalling amalgam of kidney beans, maple syrup and raisins. I had a bag of white bean flour in my pantry and have made some garbanzo bean pie pastry in the past with success, so I set to it, with some tweaking here and there. Most notably, the pastry recipe called for 3/4 cup of cold water, which would have made an unworkable slurry rather than a good, workable crust, so that must be a misprint. Let Brie sit, unwrapped, at room temperature, while you make your pastry. Mix together white bean flour, cornstarch, cornmeal, baking powder and salt in mixing bowl. Cut in shortening with pastry blender until it resembles coarse crumbs. Mix together egg white and water. Add enough water to pastry mix to make it a smooth, workable dough. You may not need to add all this liquid. Maneuver pastry into a ball and then squash it down between two sheets of plastic wrap. Parchment paper will not do, as the dough will stick to it and cause inappropriate amounts of cursing in the kitchen. Roll dough out to about 1/4 inch thickness in a roughly rectangular shape. Peel off top layer of plastic wrap and then play your wedge of Brie, top side down, over your pastry. Wrap your cheese in the pastry, pressing down the seams to make your pastry case as hole-free as possible. 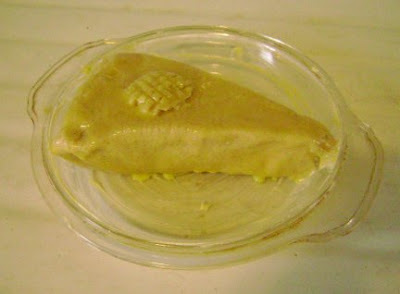 Grease a glass pie pan with some extra shortening and then flop your pastry-wrapped cheese right-side up in your pan. Again, the dough is eminently pliable, so you can adorn it with fancy pastry scraps. I gave my Brie a pastry boutonniere for a little extra Gallic elegance. Whisk up your remaining egg yolk and brush over the top of your pastry. You are now ready to bake your Brie! Bake your production at 375 degrees F. for 15-20 minutes, or until pastry is golden brown and melting Brie has popped the seams of its pastry shell. We ate this for Second Breakfast on a rainy mid-morning, but I imagine that this luscious cheese experiment would be wonderful as a romantic meal paired with grapes, pears and a bottle of lusty red wine. Note: This makes enough pastry to wrap 3 wedges of Brie. I used the remainder of my pastry to make a 9 inch pastry shell for a pumpkin pie (the crust edges burned so next time I would cover the rim with foil), but I would imagine one could freeze the remainder into pastry logs to freeze and roll out another day. Please join in the fun when our current Cook the Books hostess, Jo of Food Junkie, Not Junk Food, rounds up the blog posts about "French Lessons" and the foods we cook up inspired by our reading. The deadline to do so is November 8th, and then it will be my turn to host this fun, bimonthly biblio-foodie fiesta. Anyone can participate in Cook the Books as long as they read the selected book and blog about it and some edible inspiration. 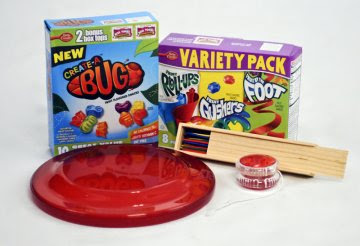 Betty Crocker recently sent me a couple of their fruit-flavored snacks to sample, and included a fun "Simple Joys" prize package that included some pick-up sticks, a light-up yo-yo and a frisbee. The fruit-flavored snacks are gluten-free, and were a hit with my two daughters, especially the roll-up "tape". I find them too sweet, but kids like the taste and the lurid colors. As for the toys, the light-up yo-yo was the overall family favorite thing to play with. Martha the dog would have just snacked on the frisbee, so we passed it on to our local charity thrift shop. 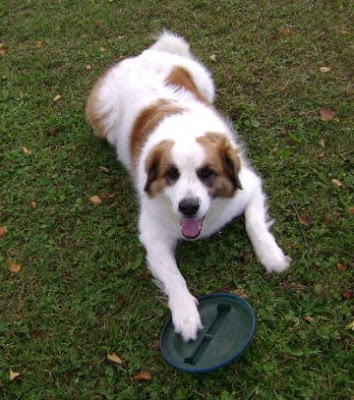 For dog owners in a similar situation, we recommend buying a Nylabone frisbee for around $20 at your local pet shop. Martha loves catching it and can't chew off pieces, plus it has a nifty "bone" that sticks out of the top that she can latch onto when she fetches it back to us. Anyway, I am pleased to say that I can offer a similar "Simple Joys" prize package to one of my Crispy Cook readers (U.S. residents only, though). Just leave a comment after this post telling me about your favorite childhood toy and Martha will assist me in randomly picking a winner from the comments after November 15, 2009. 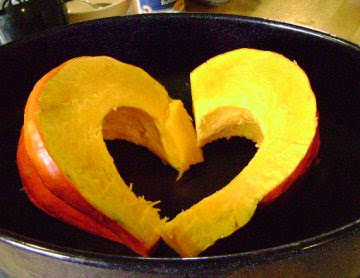 I Heart Pumpkin. What a great bounty from the old pumpkin patch this year. I planted four hills of Rouge Vif d'Etampes, a French heirloom variety this year, and even after giving away pumpkins to various friends, I still have ten pumpkins adorning my kitchen floor (we have had our killing frost so my babies have to come inside). After last weekend's pumpkin bonanza, where I got 16 cups of pumpkin puree out of a 30 lb. beauty that was almost as big as Cinderella's Coach, I cooked up a big batch of pumpkin treats for my family. And a couple of Impossible Pumpkin Pies using Susan the Fat-Free Vegan's great recipe. You mix up all the ingredients in a blender or food processor and then pour it into your pie pans. 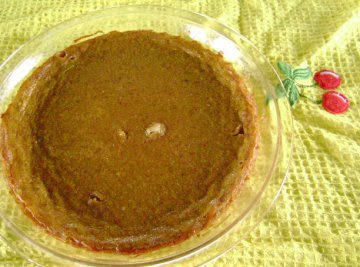 This pie comes out very custardy and makes its own crust on the bottom. No foolin' around with rolling out crumbling gluten-free crusts between waxed paper and then cursing while attempting to transition them into the pie pans. 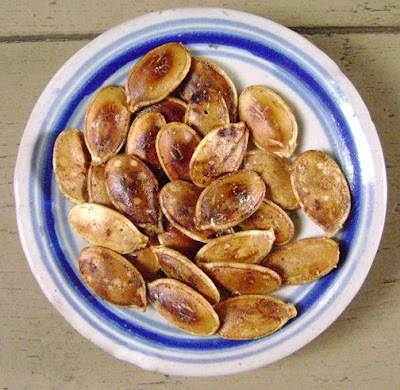 Rinse and remove pumpkin flesh from seeds. Pat dry. Toss with corn oil to coat, sprinkle with salt and pepper. Place on lightly oiled cookie sheet and toast in a preheated 300 degree F oven and toast, stirring every 15 minutes, for about an hour. Voila! A nutty, healthy treat! This trio of pumpkin delights is being sent over to Life, Gluten Free, who is the current hostess of Go Ahead, Honey, It's Gluten Free, a monthly blog event started by Naomi at Straight into Bed Cakefree and Dried. The theme of this month's round is "Pumpkin Treats" and I look forward to the roundup for other autumnal cooking ideas as nine other pumpkins await me in the Crispy Kitchen. Life, Gluten Free will post the roundup after the end of October, so do join me in stopping by for a tasteful peek at some more pumpkin fun. My mom always thoughtfully makes special dinners for our family when we come to visit, even though Dan's gluten-free diet makes her nervous. And the vegetarian part makes her crazy so she and her husband try to entice him into partaking of the meaty dishes on the table and convert him back to the carnivorous realm. Steam cauliflower in boiling salted water until al dente. Place in buttered baking pan. Melt butter in saucepan. Whisk in flour. Add salt, sour cream, milk and eggs. Stir until creamy and until lumps are all gone. Add in cheese and stir until melted. Pour over cauliflower in baking pan. Bake at 350 degrees F for 1 hour, or until nice and bubbly and browned on top. Pumpkins and gourds have never been big players in our home gardens. The vines and umbrella leaves are so huge and I've really only thought of them for table use in pumpkin pies, so I never wanted to devote a whole lot of valuable garden acreage to their cultivation. One time we had a volunteer pumpkin vine running out of our compost heap from a decaying roadside stand giant pumpkin purchase, but planting them on purpose was never considered until this spring, when the voluptuous curves of the French heirloom variety, Rouge Vif d'Etampes, made its siren song from the seed catalogue. This heirloom variety looks like a giant red cheese and after a slow start in the wet back garden (those cucumber beetles kept bedeviling my seedlings) they took over the entire patch and were very poor neighbors to my adjacent rows of string beans and cabbages. 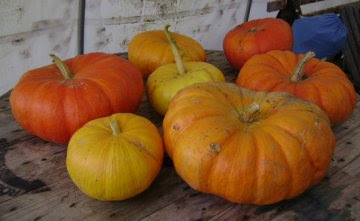 We had a nice harvest of varying size pumpkins, and they come in an array of red, yellow and orange shades, with varying degrees of ridginess. The Rouge Vif d'Etampes variety is an old French market pumpkin, so naturally they make for good eating in addition to their stylish good looks. I decided to cook up one of my best-looking monsters (and one of the biggest, weighing in at 30 pounds!) and brought this lovely pumpkin inside. 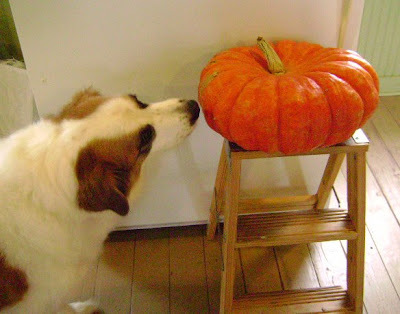 My trusty scullery hound, Martha, was a little apprehensive about this Giant Vegetable, but a little peanut butter spread on the outside eased her mind. The first order of business was to wash the outside and then attempt to carve the pumpkin into wedges for roasting. This was quite a feat and worthy of a Halloween horror movie. It involved a cleaver. And my biggest kitchen knife. I thought about a machete, or perhaps a small brush chainsaw, but Martha objected. The pumpkin grinned in a terrible rictus. 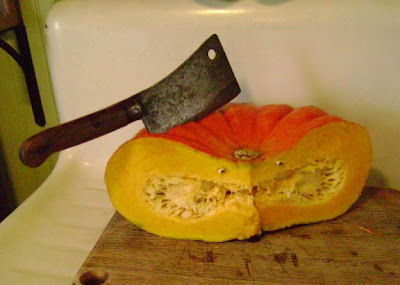 In the end, I would cleave deep into the pumpkin, then remove it and lever in my kitchen knife to hack off small wedges. The Rouge Vif d'Etampes is flattened (some might say squashed) so I found that trimming the tapered ends worked better to scoop out the seeds and strings. A grapefruit spoon was the instrument of choice for that project. I filled a roasting pan and my largest baking dish with a 1/2 cup each of water, laid in the pumpkin slices and then roasted them for 1-1/2 hours at 375 degrees F. And that only dealt with half of the pumpkin! So I repeated that process over the course of an afternoon. 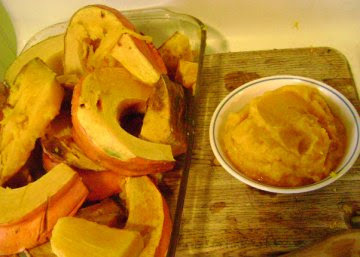 When cooled, I scooped the pumpkin flesh from the skins and then pureed it in my food processor. That 30-lb. pumpkin made somewhere just shy of 20 cups of pumpkin puree! Some went into my already-stuffed-with-garden-harvest-freezer and about half was set aside for a second day of pumpkin mania. 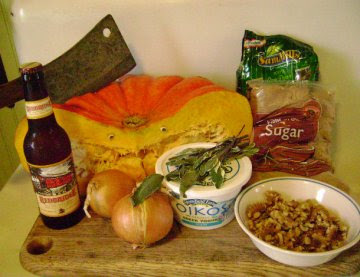 There is a Royal Foodie Joust underway over at the Foodie Blogroll Forum and the three ingredients which must be jousted with to create a recipe are pumpkin, dark beer and sugar. 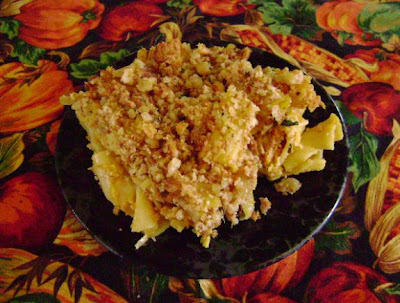 I wanted to make something savory, rather than sweet, so after perusing a bunch of cookbooks and Internet recipes for pumpkin pasta recipes, I cooked up this very elegant variation on the old comfort food standby, macaroni and cheese with a Crispy crumb topping. Cook pasta in boiling salted water until just al dente. Drain and rinse with cold water. Set aside. Heat oil in frying pan. Add onions and cook over low heat until softened, about 10 minutes. Sprinkle with 1 tsp. salt and add beer. Turn up heat, bring to boil and then cook until beer is reduced by half, about 7-10 minutes. Meanwhile, in large bowl, mix together pumpkin puree, yogurt, brown sugar and Parmesan. Mix in cooked onions and blend well. Carefully mix in cooked pasta (GF pasta tends to be brittler than wheat pasta) and pour into a greased 9 x 11 baking dish. Place walnuts, bread crumbs, and sage in food processor and whizz it up until crumbs are coarse. Season with salt and pepper. Sprinkle crumbs over macaroni in baking pan and dot with bits of softened butter. Bake at 375 degrees F for 30 minutes, or until topping is Crispy and golden brown. This was truly a great recipe for our family. My kids liked the familiarity of the mac n' cheese, while Dan and I enjoyed the subtle flavors of beer-braised onions, earthy sage and pumpkin. Enjoy! Things are winding down in the Crispy Garden. I'm finally getting around to weeding some of the beds, I'm embarrassed to say, but the weather has been lovely and in between weeding, I'm tucking in various kinds of garlic to harvest next summer. And this prehistoric patch of Brussels Sprouts awaits our consumption after the first frost, when the little sprouts are even sweeter. I have my herb patch still soldiering on and a couple of lonely red cabbages. 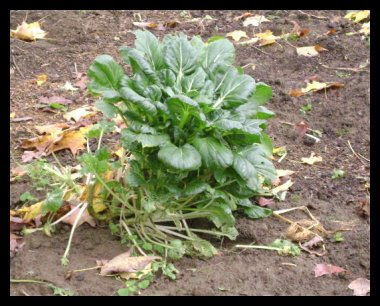 A single Tatsoi plant remained from my Spring planting, at least one that hadn't gone to seed, and was shivering under some fall leaves. So I grabbed it and into the cooking pot it went! I had been thinking about this month's round of No Croutons Required, the vegetarian foodie event alternately hosted by Tinned Tomatoes and Lisa's Kitchen. The current challenge is to make a soup or salad using the contents of one's cupboards (and maybe a nip out to the autumn garden!). Frugality is the name of the game and participants may not go to the store to purchase ingredients specifically for their chosen dish. 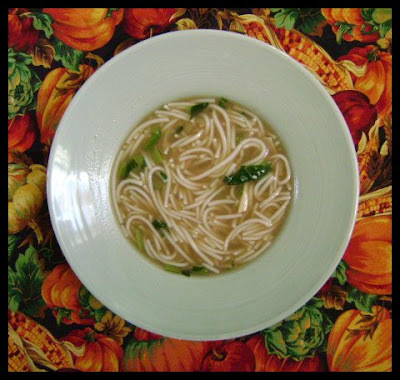 My lonely bunch of tatsoi was the inspiration for this Chinese-style soup. I had read that tatsoi is often a soup ingredient in Chinese cooking, but hadn't yet experimented with it. I chopped the crunchy stalks off and diced them up to add to the soup pot a few minutes before adding the leafy parts and that made a nice counterpoint. The leaves got very silky and tender and were perfect in this hot, noodly broth. Cook rice stick noodles in a large pot of boiling water for 6-8 minutes, or until soft. Drain and rinse under cold water for one minute to remove starch. Reserve. Remove stems from tatsoi and dice finely. Rough chop the leaves. Bring 6 cups of water to a boil. Add garlic, bouillon cubes, ginger and soy sauce. Return to boil and then let simmer 10 minutes to cook garlic and ginger. Add tatsoi stems and cook, stirring often, another 5 minutes. Add leaves and cook only a minute or two to get the tatsoi to soften. 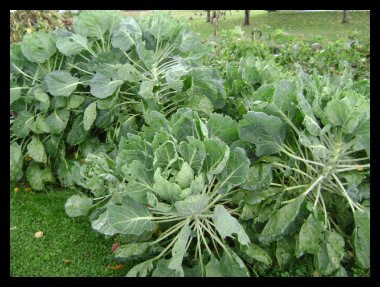 The tatsoi leaves get velvety soft and the stems still retain a nice crunch. Add noodles and heat through. I reheated this soup the next day and threw in some leftover diced smoked tofu and that made it a little richer. The noodles had also soaked up more of the soup stock and got very plump and soft. In addition to sending a bowl of this garlic- and ginger-scented soup over to Tinned Tomatoes for No Croutons Required, I am going to wing a bowl over to Deb of Kahakai Kitchen for her weekly Souper Sundays event. It was that good. What a weird gardening year. After an inordinately slow start with our cooler and rainier than normal Spring and Summer, the Fall garden season has been balmy and today, October 7th, we have yet to have a killing frost. The always fertile zucchini plants keep pumping out produce, though the vines are somewhat withered, and my bell and frying pepper plants just keep fruiting away. The trees are just shy of the peak of autumn color, but we still have summer veggies. Just plain weird. Faced with this autumnal abundance, we have been eating a lot of peppers and eggs, peppered tomato sauce, raw pepper strips, and packing egg and tuna salad into small hollowed-out peppers for breadless lunches. Not to mention those countless numbers of diced peppers cryogenically preserved in my chest freezer and which fly out to bonk us in the head every time we open the overhead freezer compartment in our refrigerator. To keep up with this pepper bonanza, I decided to make some stuffed peppers. I have a gorgeous bunch of Busillus pepper plants which are still blossoming away. They are very faintly hot when cooked and they make my hands tingle slightly after I handle them, so people with sensitive skin should probably wear gloves. And try not to rub their eyes right afterward either. 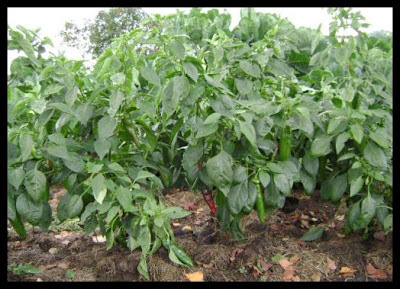 Some of the Busillus Peppers are turning a glorious red, but most stay dark and glossy green. Despite their unfortunate name (doesn't Busillus sound like a pathogen? ), they are a new favorite in our garden. They are incredibly productive and taste wonderful fried up with onions and garlic as the basis for other dishes, but I wanted to feature them (and use a good number of them up) in a casserole for supper, so I came up with this version of the classic rice-stuffed peppers. It was a satisfying supper and was even better heated up as leftovers for successive lunches. The queso fresco cheese gets soft, but doesn't melt as much as other cheeses, so if you want a gooier stuffed pepper, you could substitute Monterey Jack. The herb patch is still green, so I harvested some fresh cilantro, plucked some homegrown garlic from the garden shed and got creative in the kitchen. Line a 9x13 inch baking pan with 1/2 cup enchilada sauce. Bring a pot of salted water to a boil. 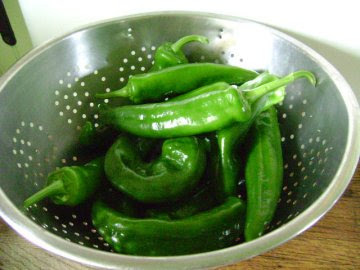 Working in batches, blanch prepared peppers 4-5 minutes, or until skins are easily pierced with a fork. Drain and cool. Repeat with remaining peppers. 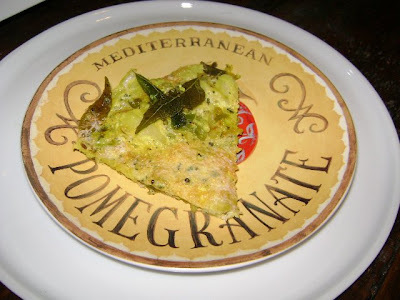 Cut queso fresco into wedges as below. Heat oil in frying pan. Add garlic and cook, stirring, one minute. 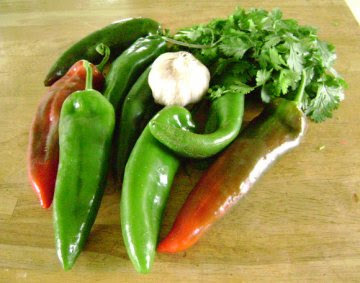 Add onion and chopped peppers and cook until softened, stirring occasionally, 7-8 minutes. Add cooked vegetables to mixing bowl. Add rice, cilantro, and salt and pepper to taste. Mix in about 1/2 cup enchilada sauce to moisten. Stuff about 2 Tbsp. rice mixture into each blanched pepper. 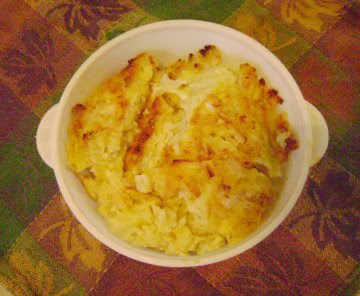 Place a wedge of cheese in the center and place in prepared baking dish. 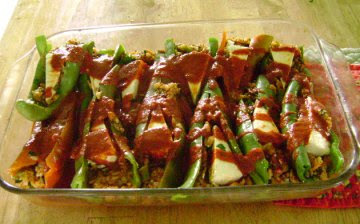 Drizzle peppers with remaining enchilada sauce. Cover baking dish with foil and bake in preheated 350 degree F oven for 45 minutes. Serves 6 pepper lovers. Delicious over more plain cooked rice. This seemed like the kind of recipe that would be enjoyed over at Weekend Herb Blogging, a weekly blog event run by Haalo of Cook (Almost) Anything At Least Once, where the focus is on the Vegetable Kingdom. This week WHB is being hosted by Susan the Well-Seasoned Cook, whose blog has lots of gorgeous photography and is the headquarters of My Legume Love Affair. Susan will have a roundup of all the Weekend Herb Blogging entries after Sunday's deadline, so be sure to swing by and see what everyone's playing around with in kitchens from around the world. Last month the Crispy Cook offered a copy of "Toujours Provence", by Peter Mayle. The randomly selected winner is Natashya, the Canadian blogger behind the adventurous, tasty and beautifully-photographed Living in the Kitchen with Puppies. I've gotten to know Natashya a little bit through her thoughtful posts for the Cook the Books Club, where we are reading Mayle's newest book "French Lessons: Adventures with Knife, Fork and Corkscrew". Please feel free join us in reading the book, cooking up something inspired by our reading and then blogging about it by November 8th. Anyone can submit a post in our bimonthly foodie book club. Anyway, congratulations Natashya! 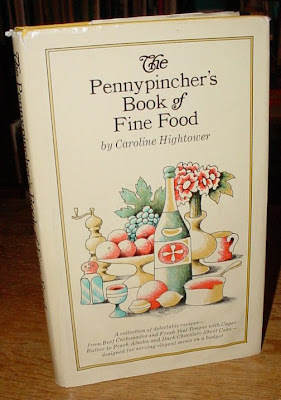 For the October Cookbook Giveaway, I thought it would be topical to offer a book on frugal cooking and hereby announce that this month's cookbook is a gently used hardcover copy of Caroline Hightower's "The Pennypincher's Book of Fine Food" (NY: Simon and Schuster, 1968). Everyone can always use some economy in the kitchen and Ms. Hightower's book offers some grocery shopping tips and good advice for saving on the cost of food and drink, such as "The best way to save money on liquor is to serve dinner on time". Ha! I learned that the hard way at a few family Thanksgivings. Mostly, though, our featured cookbook is a good compendium of budget-minded recipes, from Curry Dip to Stuffed Eggplant to Onions in Honey and Lemon Souffle. To enter the giveaway just leave a comment below by midnight (Eastern Standard Time), October 31st, 2009. I will randomly pick a winner from the comments below and ship the book anywhere in the world to the winner. The curry leaf is a new favored ingredient in the Crispy Kitchen. I recently discovered the pleasures of the India Bazaar in Albany, NY, (1321 Central Avenue) where they stock a diverting selection of dried beans, spices, barfi (brightly colored "chickpea fudge"),Indian groceries, sacks of heavenly-scented basmati rice, and fresh produce. Bags of fresh curry leaves are something that I picked up on my last several visits, and upon the advice of the grocer, have stuck them in my pots of steamed rice for a wonderful scent and flavor. Curry leaves look similar to bay leaves (my husband says they look like they fell off a house plant) being glossy green ovals with pointed tips. They come from a small shrub, Murraya koenigii, which is grown throughout India and South Asia. The leaves do get softened during cooking, so I leave them in my dishes, but you can remove them like a bay leaf from finished dishes and their pungent flavor and scent will remain. You can find out more about cooking with and the botanical and medicinal properties of curry leaves and other plants at this informative website. 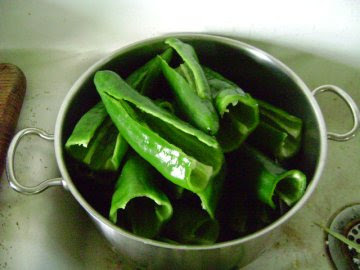 One can freeze curry leaves, but like cilantro, their flavor is much reduced, so it is best to use them fresh. I recently tried out this recipe for Parsi Potatoes with Egg and it was lovely, sort of like an exotically-spiced Potato Frittata. 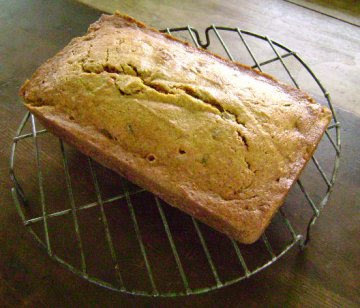 The recipe was a bit time-consuming, but the flavors were spectacular. I thought I would send this post about curry leaves over to Weekend Herb Blogging, the weekly blog event that celebrates the Vegetable Kingdom. WHB is headquartered by Haalo at Cook (Almost) Anything At Least Once and is being hosted this week by Serbian food blogger Palachinka. Head on over to see what other interesting leaves, herbs, fruit and other plant ingredients are being featured by great cooks from around the world at the WHB roundup after October 5th.